et de l’Anti Âge à l’échelle mondiale. Et, c'est la 12ème édition qui a eut lieu, en ce début avril 2014, au Grimaldi forum. puis des clients, venus de nombreux pays, afin de découvrir, les nouvelles méthodes anti­âge. En place du Salon AntiAgeing qui a lieu, à Monaco, depuis plus de 10 années, la société Zepter International présentait, au cours d' une conférence, un leader en thérapie des soinsde la peau la marque Bioptron, et ‘’le Bioptron Light therapy system’’. Lors de cette conférence, on a pu découvrir avec diaporama et film, les différentes méthode d'anti vieillissement et comprendre grâce à Bioptron, les soins les plus light afin que votre peau ne subisse aucun dommage, et que vous vous sentiez très bien, et beaux. Pendant ces deux heures d'explications, le Dr Sanja Vranic, Michaël Macnamara, Jasmine Lalosevic, Joël Levy,Zuzana Miniconi ont offert des explication significatives sur cette manière de soigner les problèmes inhérents de la peau, avec les diverses méthodes et façon de la soigner, de la régénérer et retrouver la plus belle des esthétiques pour les patients. to take place in the superb city of Medellin. Under the scientific supervision of the World Society of Interdisciplinary Anti­aging Medicine (WOSIAM), the AMWC 2014 will mark its 12th anniversary with an advanced program content developed by the reputed scientific committee. Based on the AMWC’s unique hallmark, the congress program is planned around effective aging prevention and treatment by comprehensively addressing aesthetics strategy (dermatology and surgery) for the external appearance and applying anti­aging medicine for internal wellbeing. The congress overall concept is “Be Ready for the Future” emphasizing on not only the importance of keeping up with recent knowledge and technology and worldwide practice but also on preparing the participants to meet the challenges of the changing world. In preparation for the AMWC 2014, the scientific committee has been working hard to bring a very comprehensive program covering diverse aspects of the related fields with an aim to cater to the needs of various specialties. The AMWC 2014 will propose accordingly numerous advanced academic and clinical sessions with lectures presented by selected internationally acclaimed and enthusiastic faculty members and experts from over 95 countries. Recent findings with clinical implications, new understandings, practical tips and tricks, innovations and emerging related technologies will be covered through interactive sessions and live demonstrations without forgetting those indispensible basic knowledge revision and update sessions. This highly awaited event has attracted every year over 7 500 participants coming from more than 120 countries. Over 250 leading International companies, showcasing on the 4­floor exhibition area, will be waiting for you to discover their latest products, technologies and services. Beyond scientific and educational exchange, we are confident that you will enjoy your visit of the very exclusive and elegant Principality of MONACO. 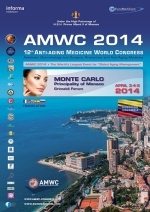 We look forward to welcoming you to the AMWC 2014!